It was the end of the week. I had a couple of hours before going out for tea and meeting a friend and his 4-yr-old. I thought about buying some cupcakes on the way. But Lil A was taking his nap and I decided to use the opportunity to scan the fridge. I came up with some strawberries and a couple of eggs that I could use. The pantry had the rest of the stock for a cake. 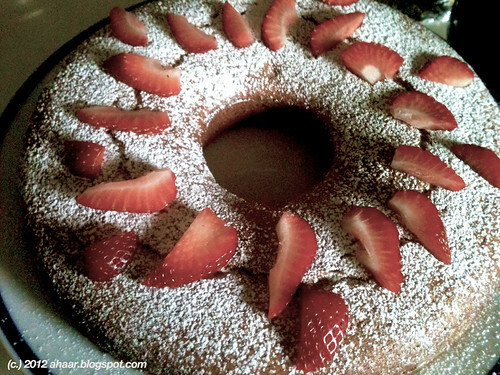 Hmm, I could bake a strawberry cake too, I thought and decided to try it. 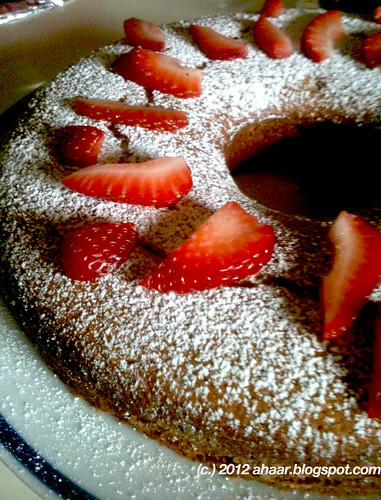 I pureed the strawberries, and mixed in the cake, but didn't get any dramatic colors! Guess you have to use some food coloring for that pink/red color. It did have a faint strawberry smell, taste and some texture too. The cake was eaten up by the 2-yr-old, the 4-yr-old and the adults too. I'm glad I tried this. It will be a go to recipe along with the other strawberry cake I baked for Lil A.
Preheat your oven to 350° F (180° C), butter and flour the pan and keep it aside. Beat the eggs and sugar until it becomes thick. Then slowly add in the oil. Stir in the flour, baking powder and salt in the mix, and then the strawberry puree, little bit at a time. Beat until smooth, and then mix in the vanilla extract. Add the batter into your pan, and bake for about 40-45 minutes till the toothpick comes out clean. 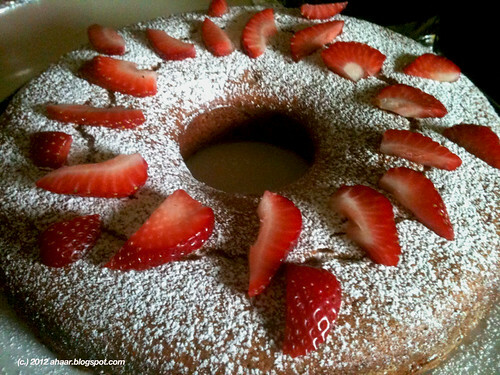 Cover it with powdered sugar, and sliced fresh strawberries and serve. Arijit is a dear friend of ours who is working as a journalist in North East India. If you live in India, you've probably seen him and his reports on CNN-IBN. 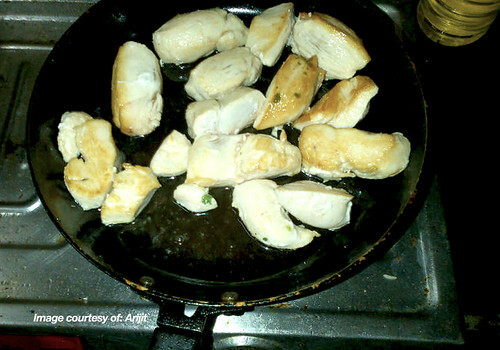 Just a couple of days ago, Arijit was getting out of work when he texted saying he was going to try making murgi-o-begun. I didn't have a recipe for him but had some ideas. And we continued in this vein for sometime and off Arijit went and created his magic. 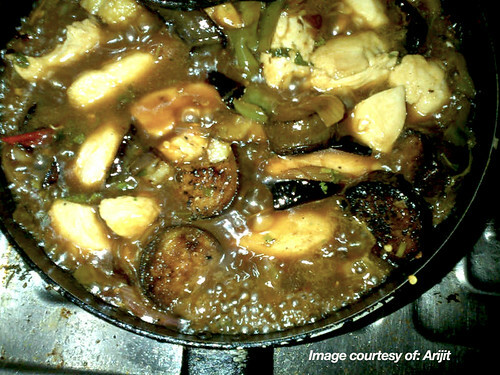 He said that the curry came out great and instantly I knew that this would be a great recipe. So I pestered him till he gave the recipe and some pictures for ahaar. :) Thanks Arijit! Here is how he made murgi-o-begun. Rub the eggplant with little bit turmeric and salt and then shallow fry the eggplant. Keep it aside. In a saucepan, heat oil and then add the garlic and onions, Saute for a couple of minutes, then add the dry red chillies. Then add the bell peppers and saute for another couple of minutes. Then add the sweet chilli garlic sauce, lemon juice and soy sauce and cook for a minute on low heat. Then add water and let it cook for another minute. Then add the eggplant, salt and the sugar and let it cook on low medium heat. In the meantime, in another pan, add the rest of the oil and shallow fry the chicken breasts till they start turning brown. Be VERY careful so that it does not become rubbery. Then add the chicken in the gravy and let it cook for another 12-18 minutes till the chicken is cooked. Serve hot with rice, roti or even bread. Enjoy! My parents are visiting and that means our menu has more Bengali food cooked by my parents nowadays. Whether it is regular macher jhol (fish curry) with salmon or mooger dal or special delicacies like this bitter or tetor dal and chingri macher malai kari, we have been relishing all of this and more regularly. 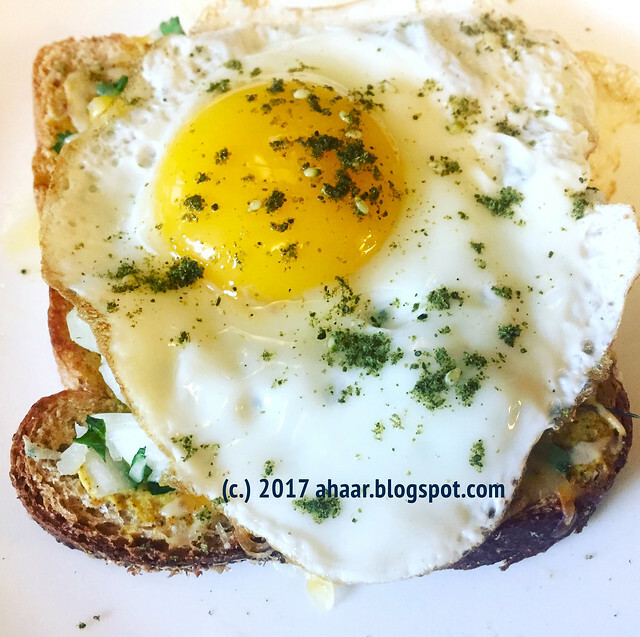 As I try to record my parents recipes, I have been thinking for some time now about how to add their personal touch to the blog posts. I thought about video, but they're not very comfortable with it and doesn't work. Then I started thinking about audio and the more I thought about it, the more feasible it seemed. When I spoke to them, they were open to the idea as well. 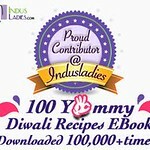 So I am launching a new audio series where I will have short podcasts with my parents describing the recipes in Bengali. This is very personal project. Just having their voices recorded for eternity telling me how to cook some of my childhood food is very dear to me. It's the first one and has it's glitches, but hopefully it will get better. The podcast is a conversation between me and my mom about tetor dal. Even though it's called bitter dal, it really isn't. 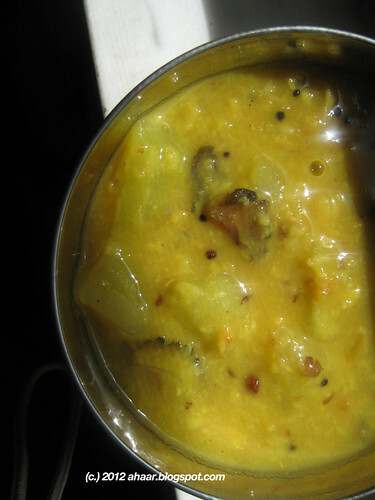 It's mild flavored dal with karela or bittergourd in it. 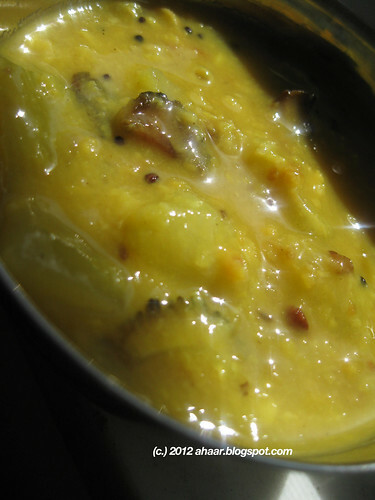 This Dal is best enjoyed with rice and some green chilli or katcha lanka, and some veggie fritters. 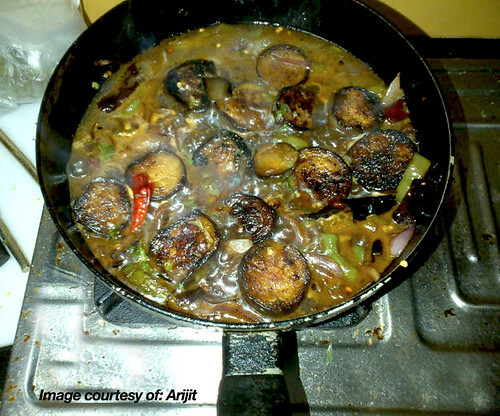 Mostly, it's served at lunch and is considered part of traditional Bengali lunch. Saute the moong dal on medium heat for a few minutes till the aroma comes. Wash and then put it in a pressure cooker withthe bottlegourd pieces. Add 1/2 tspoon turmeric powder, 1 tspoon oil and salt to taste. Cook it to 3-4 whistles till the dal and lau is cooked. Mix the bittergourd pieces with salt and turmeric and keep it aside for 10 minutes. Then heat 2 tspoon oil in a pan and stir-fry them till they are done. Keep it aside. 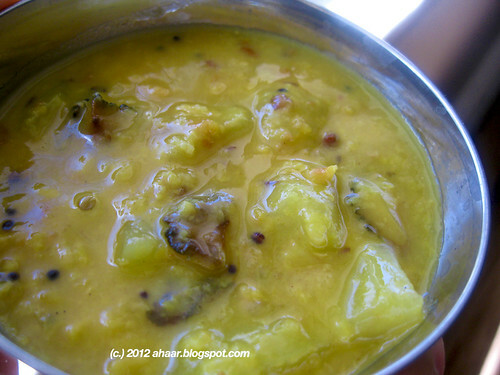 In a saucepan, heat the ghee and then add the bay leaf. 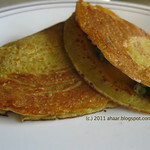 Then add the methi seeds, cumin seeds and the mustard seeds in that order. Then add the ginger and saute for a minute. Add the bittergourd, and then the dal and let it all mix and cook together for 3-4 minutes. Take it off the heat and serve hot with rice. This tetor dal is going to The Well Seasoned Cook - Susan's 46th Legume Affair. Thanks Susan! 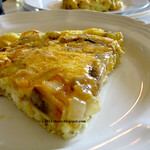 I have finally created a Faacebook page for the blog where we can have more conversation about food, recipes, and life in general. 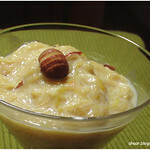 Please go to https://www.facebook.com/ahaarblog and "Like" the page.